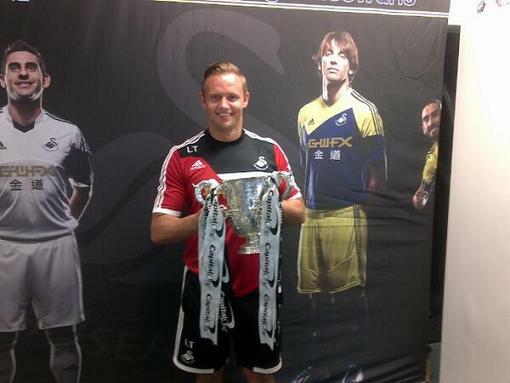 On their way up the leagues, Swansea City gained a club icon in striker Lee Trundle, and whether for flashy skill, clinical finishing, or even stage presence, ‘Magic Daps’ always did know how to steal the show. The Liverpool-born ex-forward’s late arrival in the professional game is well-documented and it wasn’t until he was 24 that he signed for Wrexham in the Football League. Two years later, he joined Swansea City following their final-day escape from Division Three relegation in 2003 and it is fair to say the pieces ultimately just fit together. Lee’s hugely prolific scoring form and a taste for showmanship made him an emphatic favourite with Jacks and he left for Bristol City with a heavy heart in 2007. His loan move back to the Swans in 2009 was celebrated as he returned to what was now a Championship side, giving supporters five more goals to cheer from their hero. 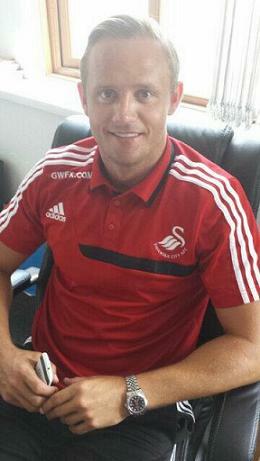 Following his retirement in 2013, Lee was recruited by Swansea for a third time, as club ambassador on this occasion. Combining matchday hospitality with charity and community commitments, he has also stepped into coaching with the club’s youth set-up and he remains a much-loved figure. Although a regular on Soccer AM’s ‘Showboat’ section for his skill, as the title of his 2010 book (with Chris Wathan) suggests, ‘Trunds’ was about ‘More Than Just Tricks’. Most players are called upon to sing for their teammates at some point during their career, typically as a way of initiation, and Lee raised the game after linking up with Preston North End in 2012. “We’d do it a lot at Swansea and I’ve had to sing at Bristol City and Preston as well. At Preston, we had a talent show where you had to get up there and sing or tell jokes. Scoring 91 times in 194 games in all competitions, Lee was instrumental in setting Swansea on the way to becoming the established Premier League club they are today. Before his games at Wembley and The Millennium Stadium, he had made a local name for himself at the likes of Bamber Bridge, Southport and Chorley, and there would often be evidence of his North West connections on show before kick-off once he made it as a professional. “I’d always get the music and get some from a few friends in Liverpool. I’d get CDs off Ian Longo, a Scouse DJ, for the changing room. “Later it went from CDs to everyone in the team choosing a song for the iPod playlist. Darren Byfield would get involved with the music at Bristol City, Marvin Elliott as well, and at Swansea we had Izzy Iriekpen. 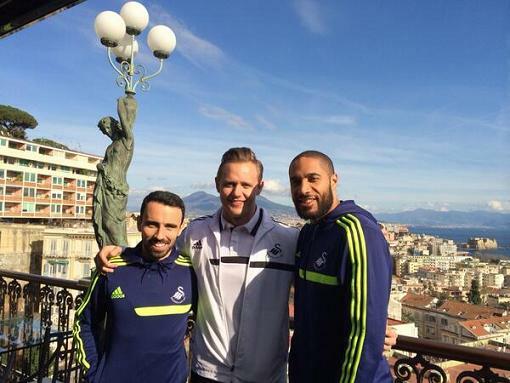 “At Swansea, it was mostly dance whereas at Bristol City it was a bit more r&b and rap. I’m more into slower r&b like Joe and Maxwell so it was a bit different from the stuff I like. From an overhead kick with Wrexham as his first professional goal, to the shoulder roll trick with Swansea that has never been forgotten, Lee had that bit of invention and audacity that captures supporters. As he explained, he opted to help create a dressing room atmosphere rather than locking into his own zone in the moments before a game, and music was an integral part of that. Each player featured on here delves into the soundtrack to their career and life and Lee has always had something for every situation in that regard. “I’m into all different types of music. If I’m on a night out I like house music and when I played I used to put my house CDs on or have it on my iPod to get me going. “On a normal day I like listening to r&b and jazz. In school, I remember being into The Doors and Fleetwood Mac, and before that, Rick Astley and Shakin’ Stevens. “Probably my favourite ones I’ve seen live would be Stevie Wonder and George Benson, both in Manchester. I’ve been to Creamfields but I’ve never been to Glastonbury or a festival like that. Every Swansea fan from the time recalls May 3rd 2003 at the Vetch Field as a Lenny Johnrose goal and a hat-trick from James Thomas secured the 4-2 win over Hull City that kept the South Wales side in the Football League. Alan Tate and Leon Britton started for the Swans that day and went all the way to the Premier League with the club, playing alongside Lee many times en route to the top flight. A homegrown midfielder who was making his way up at the end of Lee’s first spell and figuring frequently by the time he returned was Joe Allen. Now with Liverpool of course, he impressed his Swans teammates with something other than his play in the middle of the park. Lee recalls that, as well as how a current Burton Albion midfielder brought some melodic prowess to Deepdale. “There’s been a lot of bad ones but John Mousinho who was at Preston is a singer and plays guitar, so he was really good. Another good one was Joe Allen when he was at Swansea. Hitting the 20-goal mark in each of his first four seasons with Swansea, interest from elsewhere was inevitable. With the Swans challenging for promotion from League One in 2005/06, he discussed a bid from Sheffield Wednesday, struggling in the Championship at the time, with chairman Huw Jenkins and decided he wanted to stay and help fire the club to promotion. Lee did get to play in the second tier as a Jack but it was to come via a loan from Bristol City, who had bought him for £1million from the Swans in 2007. Swansea reached the Championship in 2008 but at the time of Lee’s switch to Ashton Gate he was stepping up a division to test himself. His time with the Robins did not work out as he would have hoped but he did manage eight goals, including a memorable extra-time effort in the Championship play-off semi-final in 2008. That strike against Crystal Palace edged Gary Johnson’s team towards Wembley and although a victory in the final was beyond them, there had been a famous night at Ashton Gate enjoyed in getting there. After his goal, Lee showed off a dance move with his hand and his chest, which came from one of his fellow strikers at the club, as he explains. With the dance moves in the bag, what about if Lee was to go down the singing route and record a song cover with one of his career teammates? Having scored 12 goals to aid Wrexham’s promotion to Division Two, Lee stayed in Division Three, signing for his former manager Brian Flynn at Swansea. He went on to work with Kenny Jackett, winning promotion to the third tier in 2005, as well as Roberto Martínez to round off his first Swans spell. When he returned to The Liberty Stadium on loan from Bristol City in 2009, Paulo Sousa was at the helm and was the final Swans manager he would play under. Lee’s first goal for the club had arrived against Bury in August 2003 and Jacks got to cheer one last strike from their favourite in the 1-0 home win against Plymouth in December 2009. Of his near-century of goals for Swansea, it is the wonderful effort in the 2006 Football League Trophy final win against Carlisle, as he chested it down and volleyed home, that stands out as Lee’s favourite. The fact he now goes out and meets people on behalf of the club speaks volumes about how highly regarded he is, but how would he sum up the reasons why the Swans became ‘his club’? “When I came in we’d just managed to stay in the league on the last day the season before. The last person to score over 20 goals was over 20 years ago and I think I came along at the right time and each season I managed to get at least 20 and the fans took to me. Growing up on Merseyside as an Evertonian, Lee also took some inspiration from a Liverpool great amongst the attacking talents he admired. “There were a lot of players I looked up to. At Everton there was Graeme Sharp and Gary Lineker, but then Kenny Dalglish’s style of play was one I tried to emulate. With a loan stint at Leeds United, as well as time with Preston, Neath, Chester and Marine at the end of his career, Lee still plays locally when he gets the opportunity. He got to taste some of the glamour side eventually but there can be no disputing his love for the game and the journey he went on from the days of those non-league pitches (and back again). If he had the chance to go back now with all the knowledge and experience he has, would he approach anything differently? “It’s no secret that I turned professional at 24 and before that it was because of my attitude. Plenty of times I didn’t turn up to training or games and I’d go down to my local youth club and play 5-a-side. 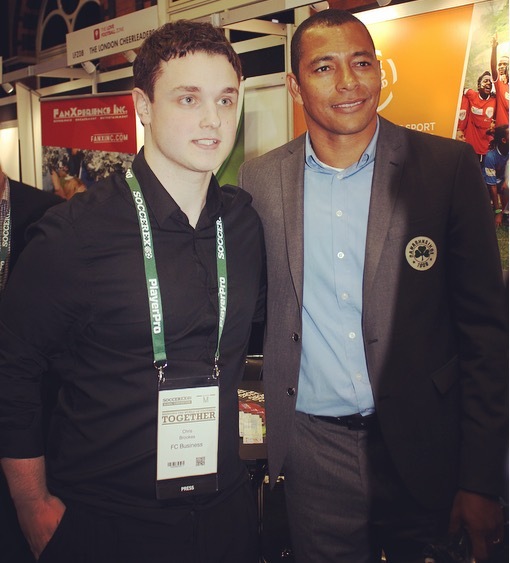 Always genial, Lee is someone who Swans supporters are still delighted to meet at every opportunity. Besides his family time and his role at the club, are there any other interests or ambitions he has in mind? Appearing for Bristol City at Wembley, Lee experienced both sides of the Millennium Stadium experience as a player. The aforementioned success against Carlisle preceded the 2006 League One play-off final with Barnsley in which he scored Swansea’s first in the penalty shootout loss. An icon to Jacks, without covering too much old ground, it is little surprise that he sticks in the minds of fans of their arch rivals. Lee mentioned this as he discussed some of the funniest messages he has received on Twitter, as well as rumours he heard about himself in his career. “I get a bit of banter off Cardiff fans on Twitter… some of it’s banter anyway. There’s a couple of lads who started by having a go but now I have friendly banter with them. “When you play you hear a lot of rumours that someone’s seen you at a ground and you’re moving to this club or that. There was a silly one once that I got carried out of a nightclub in Swansea on a Friday night. ‘Magic Daps’ enchanted Swans followers, leaving a big mark in the club’s history books and contributing to their rise to the Premier League (profiled in the recently-released Jack to a King film). It is however time to find out some of those who had a huge impact on him through the years. Each player on the site is asked to put themselves into a fantasy 5-a-side team and to select four of the best they ever played alongside to complete the line-up. As he mentioned, Lee used to go down to his local youth club for some 5-a-side action, even when he should have been elsewhere! Here is the team he would turn up there with now. “In goal, I’d go with Adriano Basso who I played with at Bristol City. A great keeper, brilliant shot-stopper and with taking crosses. “You ‘d have a shot in training and you’d be celebrating thinking you’d scored and he’d come from nowhere and make a save. In defence, I’d probably go with Garry Monk and Louis Carey. “They’re very similar in that they’re both great leaders and tough to get past. Both brilliant characters and they’d lift the dressing room. “In midfield, I’m thinking either Leon Britton or Andy Robinson. Leon’s been through all the leagues and managed to be one of the best players for Swansea in each. “He’s still doing the business and when he’s not in the side you miss him. Andy Robinson – great character and ability, can play left, right or in the centre.